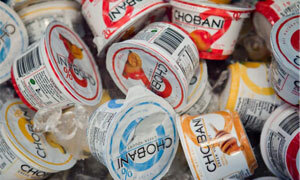 Chobani is the United States' top Greek yogurt brand and it prides itself on adding no GMO ingredients to its yogurt. However, it is likely that the company is relying on milk from cows eating a diet full of genetically modified organisms (GMOs). GMO Inside, a national, non-GMO coalition led by Green America, is calling on Chobani to cease marketing its products as "real" and "natural" until the company switches to verified non-GMO milk sources. GMO Inside is asking Chobani consumers to sign a petition to Chobani requesting the company use milk from cows who have not been fed GMOs (www.GMOInside.org/TakeAction). Consumers can also take action on Facebook by visiting www.facebook.com/GMOInside. The company, which is known to be monitoring its Facebook page for discussion this topic, is extremely sensitive to consumer feedback about GMOs. Animals, like humans, are deeply impacted by the quality of their diets. A recent study showed that pigs fed an entirely GMO diet suffered from severe stomach inflammation when compared to pigs given non-GMO feed. (See sourcing below.) Additionally, while the dairy industry has claimed that genetically modified particles are broken down in the digestive tracts of the animals that eat them, these GM particles have shown up in the organs and milk of animals fed GMOs, the same milk and meat that humans then eat. ABOUT GMO INSIDE GMO Inside is a coalition of businesses, organizations, and individuals that support a healthy, GMO-free food system. The GMO Inside steering committee, led by Green America, includes: Food Democracy Now!, GMO Free USA, Institute for Responsible Technology, Label GMOs, Nutiva, and Food Babe. EDITOR'S NOTES: At present, the FDA has approved eight genetically modified crops to be grown and sold in the US. (And even without approval, GMO wheat has turned up in Oregon). To date, no animals have been approved to be genetically modified, but salmon has been proposed. While livestock and poultry are not themselves genetically modified, they are often fed GMO feed.